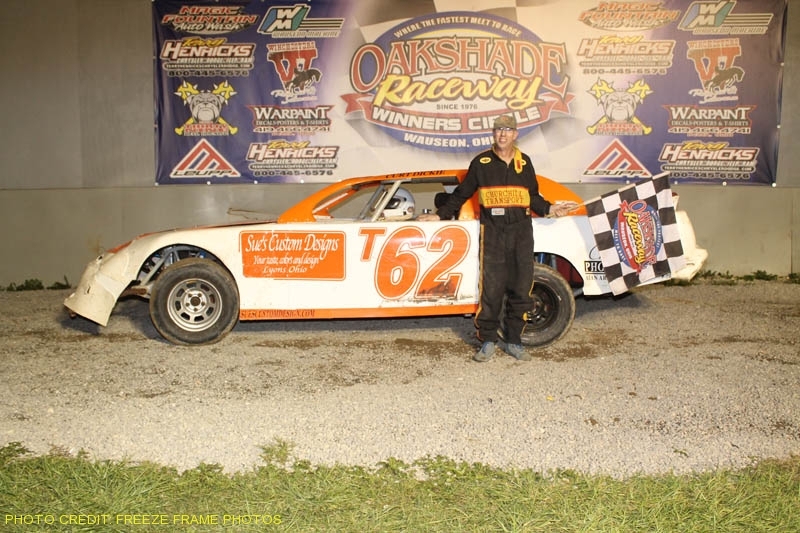 Oakshade Raceway hosted the 22nd Annual Barney Oldfield Race on Saturday night that drew competitors from all across the region to compete for the $4,700 paycheck. It was the first time Salt Rock, West Virginia’s Eddie Carrier Jr. had visited the 3/8 mile dirt oval and he came away with a last lap pass Barney Oldfield win, a lot of new fans and a great appreciation of Oakshade Raceway. It was Casey Noonan who looked strong at the start of the 40-lap Barney Oldfield UMP Late Model feature. He darted out to a large lead over Mike Bores after starting on the outside of the front row. The only caution flag flew on lap eight after Bores and Brad Eitniear tangled on the backstretch. That tightened up the field for a double-file restart in which Andrew Reaume from Blenheim, Ontario Canada took advantage of. Reaume proceeded to open a significant lead over the rest of the field and looked strong for most of the race. Once Reaume caught the traffic at the tail end of the lead lap, he seemed to struggle just a bit. His lead began to dwindle as Casey Noonan began to close late in the race. Eddie Carrier Jr. smoothly worked his way toward the front, getting by Noonan for second with just a few laps left. Reaume took the white flag as the leader, but Carrier made an exciting last lap pass on the backstretch to steal the victory away. Reaume’s fantastic run ended with a second place finish. Noonan settled for third. Curtis Roberts was fourth and Steve Casebolt was fifth. Matt Miller started 18th after transferring in through one of the consolation races and ended up sixth. Bruce Stuart took the early lead in the UMP Sportsman feature event. Tim Line and Rusty Smith made it a three-wide battle with Stuart for the lead. Smith would win that battle and took command by lap three. Line took second and pressured Smith much of the race before getting held up by a lapped car. That allowed Smith to open up a slight advantage that Line could not overcome in the caution-free race. It was Rusty Smith’s first feature win of the year. Tim Line, Bruce Stuart, Joe Derbeck and Matt Lindsey were the rest of the top five finishers. Jeff Geis got a good start in the UMP Bomber A Main and had fend off defending Oakshade Bomber Champion Jim Scout for most of the race. Scout finally made the pass for the lead with three laps to go, but Geis re-assumed the top spot on the next lap just as the caution flew for and incident involving Danny Hogrefe and Steve Morris. Geis held on the final two laps to pick up his first Bomber A Main win of the year. Jeff Foks got by Scout to finish second. Scout slipped back to third, but regained the Bomber point lead after Terry Rushlow had an engine let go earlier in the evening. Curt Lancaster and Adam Noonan finished fourth and fifth respectively. Sparky Marky Gillingham started on the pole of the Hornet feature event and led most of the first lap, but Drew Smith took the lead away just before they completed one lap. Brandon Myers and Derek Morris briefly closed in on Smith before Smith pulled away and went on to pick up his fourth feature win of the year. Morris got by Myers to finish second. Finishing fourth behind Myers was Gillingham with William Cundick taking fifth in a borrowed ride. The final event of the night was the UMP Bomber B Main and it produced another exciting finish between Ron Tolles and Chris Howard. The race started off poorly after Craig Strow got turned around in the very first corner and created a big mess that involved Terry Rump, Brad Brehm, Jon Miller and Joe Heffner. Chris Howard took over the race lead from Scott Robertson on lap two and led much of the caution-filled race. Ron Tolles closed in on Howard and won the drag race off turn four as they were coming to the checkered flag to win his first feature of the year. Robertson held on to finish third with Perry Cox, who started very deep in the field, winding up fourth. Josh Sisty finished fifth. Saturday, July 2 is Memorial Night at Oakshade Raceway featuring a full racing program of UMP Late Models, UMP Sportsmen, UMP Bombers and Hornets. Gates open at 4pm with racing at 7pm.